Last October 46 Year 12 students from schools and colleges came to the University to show off posters about the research projects that they had carried out over their summer holidays as part of the Nuffield Research Placements (NRP) scheme which is run by the Nuffield Foundation. The Nuffield Foundation is a charitable trust, whose aim is to promote wellbeing and life chances for all in society. The NRP scheme is one of their most important areas of activity and gives over 1,000 17-year-old students across the UK each year the chance to experience working alongside a researcher in a university or in industry. The University of Bath's Widening Participation department is now managing the scheme for the South West following a successful bid for the contract by Annette Hayton, Head of Widening Participation and Dr Andrew Ross, Widening Participation Science Outreach Manager. 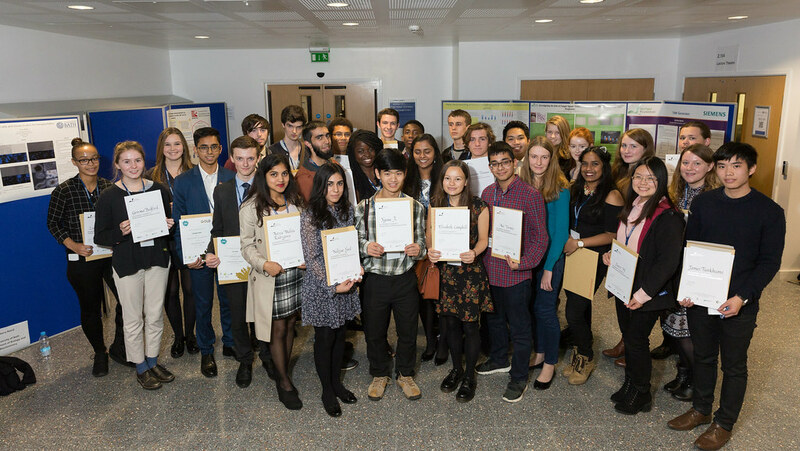 The aim of the NRP scheme is to inspire the researchers of the next generation at a point in their lives where they are making key decisions about future career or university choices and to promote jobs in Science, Technology, Engineering and Mathematics (STEM) as realistic and achievable career options. NRPs are for all academically talented Year 12 STEM students, but the focus is on supporting applications from those with Widening Participation backgrounds. All students are supported financially by the Nuffield Foundation who pay all of their travel expenses, and those from low-income backgrounds are given an additional weekly bursary on top of this.